A champagne bar in Birmingham city centre has been relaunched following a £100,000 facelift aimed at creating a warmer atmosphere for customers. 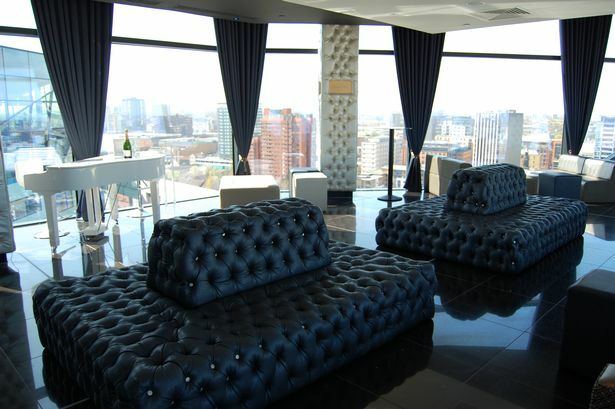 The Laurent-Perrier Champagne Bar, housed next to Marco Pierre White&apos;s restaurant on the 25th floor of The Cube, has been refurbished following the signing of a new two-year deal by the French beverage brand to supply the bar. Edgbaston-based upholstery company Mr McQueen has led the five-week project to revamp the reception, bar, seating area and balcony and which has been carried out despite the venue remaining open throughout almost the entire process. Co-founder Peter Murtha told the Post: "We were approached by operator Sanguine to have a meeting with Laurent-Perrier which felt the bar was not living up to expectations. "We started out the design process with the plan to make it more luxurious than any other bar out there. "It has a great view and the idea is to keep people in there and make it a more chilled out ambience. "It was quite cold and clinical before, the ambience wasn&apos;t warm, so people were just going for one drink and then leaving straight after. We wanted to create the &apos;wow factor&apos;. "Working with our designers, we&apos;ve looked at different champagne bars around the world and have created something that feels a bit more funky and edgy and fits in better with the Laurent-Perrier brand such as matching the furnishings to their navy blue and gold colours." Mr McQueen says up to 70 per cent of the products it uses in projects are drawn from recycled materials and its donates five per cent of its profits to Birmingham Children&apos;s Hospital where is it currently fitting out a room for parents. Its previous projects also include designing a Marco Pierre White chair for use in all of the chef&apos;s restaurant and the La Cache private members&apos; bar in Edgbaston. John Cleary, national account controller for Laurent-Perrier UK, said: "Laurent-Perrier are delighted to continue the partnership with Sanguine and their venue within The Cube. "The refurbishment is an important step in maintaining the venue as a flagship destination for Laurent-Perrier consumers in the Midlands." Adam Munday, general manager of the bar and neighbouring Marco Pierre White restaurant, added: "Laurent-Perrier is an upscale brand whose vision matches that of the Marco Pierre White venue. "Due to a combination of the bar&apos;s breathtaking city views and the current trend for champagne, it has already proved to be a big success and this renewed contract and refurbishment will further enhance the experience for visitors."